The document is a narrative that exists only in the virtual world, transmitted between members of the Rilaoan underworld through cybernetic mediated communications. It contains instructions for a revolution against the hegemonic asteroid mining oligarchs, of which the black market has emerged in opposition to. This revolution is based on the liberation from material consumption, instead relying on illicit networks to provide all social needs. 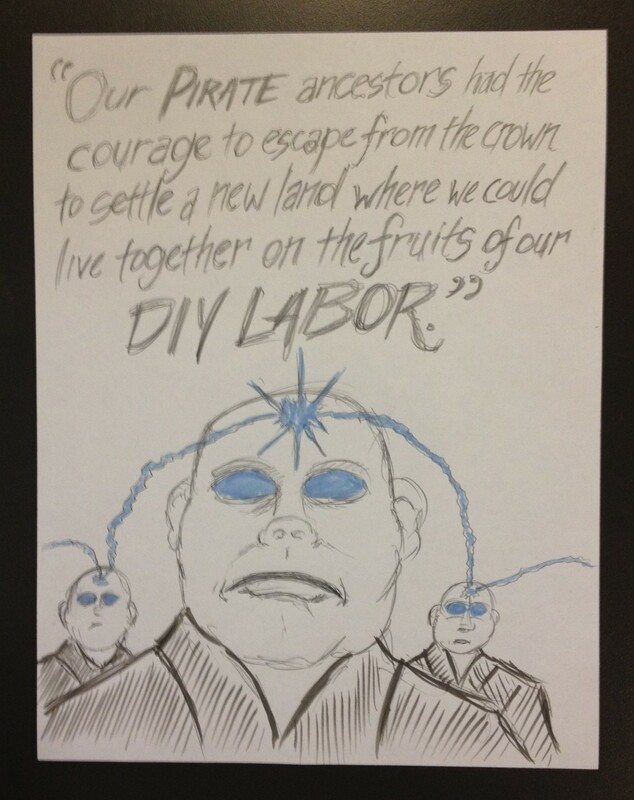 Our PIRATE ancestors had the courage to escape from the crown to settle a new land where we could live together upon the fruits of our DIY labor. And yet we have subjected ourselves to generations of plague doctors, military juntas, and corporate oligopolies, each more constraining that the last, each exploiting more of our labor, each channeling our minds to their own ends. The time has come to say ENOUGH! Today, the time has come for us to become bionic buccaneers! PEOPLES OF RILAO — THE ONLY THING WE HAVE TO LOSE IS OUR MINDS! We have the powers to move asteroids with our minds, we have the capacity to transform reality with our thoughts, so why do we continue to submit to the unreasonable demands of management? Our mental labor should be fairly compensated. Our brain children should NOT be changed into wage slaves! We will gather together the most powerful minds of our generation and then change reality as we know it. What happens after that will be up to YOU! The world will be what we make of it. We will control the products of our own COGNITIVE SURPLUS. We will be the masters of our mental labor. GET YOUR HEADS OUT OF THE CLOUD! Merge your thoughts, Channel your emotions, and harmonize — BRAIN POWER TO THE PEOPLE! Imagine what will happen when we all put our heads together. REMEMBER — A MIND IS A TERRIBLE THING TO WASTE! Our reality is consensual, so let’s stop giving our consent! OTHERWISE, THE SCANNERS LIVED IN VAIN! Our goal is the ultimate liberation of the human mind from the constraints of the body, from the commands of the state, from the never satisfied urges of material consumption, and from the dictates of the SPAWN of Lord Lao. DO NOT BELIEVE THE PROPAGANDA! DO NOT TRUST THE LIES! We are seeing the last gasp of the huffing-and-puffing remnants of the old order. They are desperate to cloud your thoughts. They are deceiving you about our movement. We ARE NOT A BLACK MARKET — our virtual market has no color except that of your DREAMS. LET THE BOOTLICKERS MINE THEIR OWN DAMN ASTEROIDS!